Product prices and availability are accurate as of 2019-04-13 17:32:53 EDT and are subject to change. Any price and availability information displayed on http://www.amazon.com/ at the time of purchase will apply to the purchase of this product. 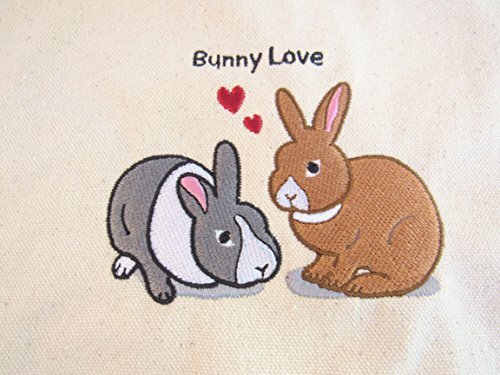 The Wheeky Pets Rabbit (Bunny Love) reusable eco-tote bag lets you reduce your environmental impact and show your love of rabbits at the same. This stylish bag measures 14.5"h x 18"w x 6"d. The color is natural cotton (white) and black. Features include heavy-duty canvas fabric, reinforced construction and handles, and gusseted seams. 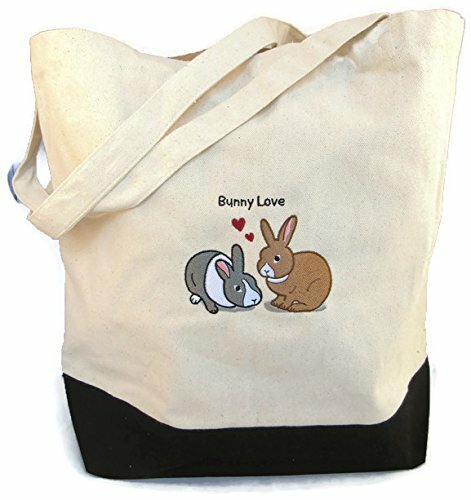 This roomy, 100 percent cotton eco-tote includes an exclusive 4.5" x 3.5" embroidered logo designed specifically for rabbit lovers. Great for shopping, library, gym, beach and more. Makes a fun gift for yourself or for the hard-to-buy-for rabbit lover on your list. Love it, or your money back, per Amazon guidelines. Bunny Love image copyright 2017 Green Oak Technology Group. All rights reserved.